Brooklyn based artist Gregory Hayes’s (b.1980) paintings immediately capture the viewer’s attention through its meticulous composition, choice of color and organization. Every drip is filled with an array of color that allows paintings to transform themselves into an optical delight. In addition to painting, Hayes often channels his creativity through poetry. For him, painting and poetry are complementary and the viewer can feel that profound connection. The artist’s mathematically- inspired grids create a unique visual language that not only soothe the eye but also the soul. We had an inspiring chat with Gregory about his art practice and his recent exhibition “From Faded Fragments” at Nancy Margolis Gallery. Yasemin Vargi: Most of your drip paintings are carefully organized and have exactness to them, can you talk about this aspect in regards to your work process? 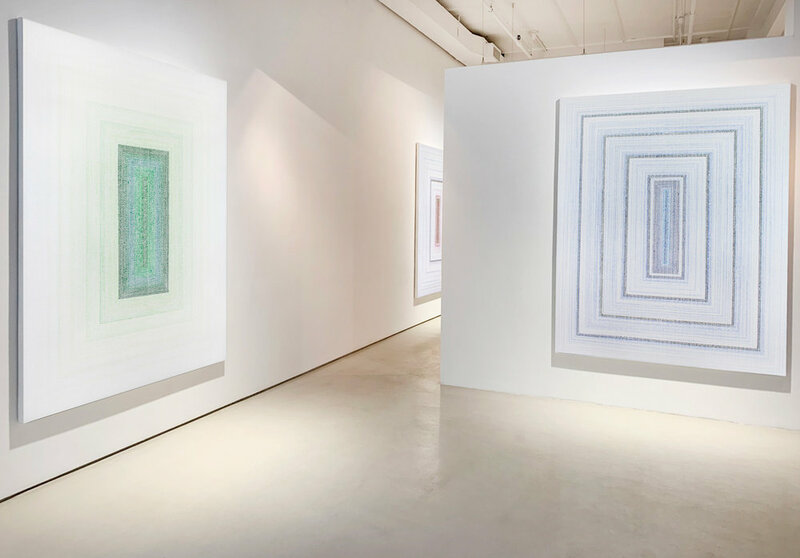 G.H: My current exhibition ‘From Faded Fragments’ on show at the Nancy Margolis Gallery in NYC until April 13, displays paintings from my ‘Color Array’ series that are based off the Archimedean spiral and attain a certain amount of exactness. The paintings are built from dripping sequential quarter inch drips of paint starting from the center of the canvas and working outwards. To guide my path, I hand drawn a graphite grid, and move around the canvas dripping in one cell at a time in a counter clockwise spiral. When you look closely the individual drips in each painting appear as convex swirling jewels, but when looked at from a distance the paintings appear as variations of patterned concentric rectangles. I achieve this by dripping several colors at a time, and adding new colors on top of the previous in the tool I use to distribute the acrylic over the canvas. Because of this method I get color sequences, some planned and some unplanned, that fade in and out as the dotted lines move across the painting. Ultimately, for me, the best part of my process is when some new color, or a combination of colors, is revealed that I didn’t plan. Or when some of the drips end up merging together to form a line or pattern on the canvas. I like when the paint behaves spontaneously. Even though I try consistently to control the paint to get the result I want, there are always surprises. I welcome this intervention of chance in my work. The end result is that each painting has many unintended marks in it—a mix of possibility and control. Y.V: How did your work evolve over the years and what inspired your drip paintings? G.H: I have worked mainly with dripping or pouring paint over the past ten years, since I started making art. One of my first series of paintings using a brushless painting technique was ‘Primary Array’. It was the most planned out and structured to date. Every decision was accounted for. Back then I felt I needed a predetermined reason to place the paint down on the canvas. These paintings were based off a mathematical formula and created seemingly random patterns built from quarter inch drips of paint. However, they were not random at all. So since then I have always been pushing away from my initial drive to make work that had predetermined decisions. I wanted to rely more on my intuition. In the beginning I wanted things to be perfect, but as I grew as a painter and as a person I realized that perfection was easily misunderstood. Perfection, as the mainstream society would have it, is based off of unattainable ideals and superficial standards. I began to see perfection as the accidents in my paintings, the smears of paint or slip of my hand, the crooked line, or the smudged of color. I began to understand that perfection was having the ability to allow each moment to be as it is, to allow my paintings to unfold drip by drip and be ok with it if something unplanned happened. I saw this outside my work too, and saw everything in my life in a new light. It was very freeing. With this, I was also able to separate exactness from the superficial perfection. By allowing myself to practice precision in my work but also give space for me to use my intuition, my work started to evolve. Each series of artworks after this realization moves away from the totally planned compositions and more towards the intuitive. The drip paintings developed out of my first semester of college at Rocky Mountain College of Art + Design where I studied with artist Clark Richert. He is a math and science driven painter and I was influenced by his way of thinking and working. I also had no formal training with a paintbrush in a fine art setting, so I didn’t have the skill set to paint landscapes or people, so when I was developing my artwork I often tried alternative ways of painting. I had always doodled shapes and patterns in notebooks in my early years of school, so creating geometric art seemed to click, especially when I was exposed to paintings from art movements like Hardedge painting and Minimalism for the first time. Subsequently with the combination of not knowing how to use a brush, and liking the artists I was first exposed to—plus studying with a professor that painted mathematically himself—I ended up using paint to create geometrically motivated art that then lead me to happen upon my technique of dripping paint. Y.V: You are a painter but you also write poetry, in what ways do these creative outlets intersect for you? G.H: My poetry is a parallel form of expression. It is a more direct way for me to relay my thoughts and feelings through this medium. My paintings are a visual language, and are mainly about painting itself. I am concerned with form, and color, and the interaction of colors. I am not directly trying to express or explore other aspects of my experience through my paintings. But with poetry I can be more straightforward. I think the intersection happens when I am able to write a poem that relays the thoughts and feelings I have when I am creating new paintings. The poems are not about the artwork, but about life happening at that time. The painting and the poetry never truly intersect; they show the two sides of my reality in two different languages. Y.V: What kind of emotions, if any, are you channeling through your works? G.H: My paintings are a visual language, and are mainly about painting itself. However, they are not void of emotions or meaning beyond that. I get a great sense of joy when I work on them and I often hope that translates through the painting to the viewer. For me the paintings become something to view and reflect upon that doesn’t need too much mind activity to connect with them. I don’t mean lack of understanding or attention, I am saying you don’t need to conceptually break the work down or analyze it; you don’t need to know the painting in that way (of course you can and enjoy the painting that way too) to find an appreciation of it. Instead the paintings can be looked at more fully, and with a deeper knowing, a universal perception. They can be experienced; they can be felt, without thinking. They are shapes, and color, and color interactions, in the reality of seeing with our eyes, and mind, yes. But they are also what is beyond our over-analyzing mind. There is peacefulness there in that space that I think we all need, and I hope that is felt in my work.